The Bowflex Max Trainer M7 is basically the same machine as the Bowflex M8 except for some technology differences and just a slight modification to the console to hold various mobile devices. You will have a difficult time getting a concise answer as to the essential differences of the M7 vs. the M8. In a practical sense, I’ve owned both machines, so I will spare you some time and explain the difference as best as I can: Other than the console layout, the mechanical hardware of the M7 vs the M8 is 100% the same. In a nutshell, the difference is that the Bowflex M8 includes interactive Bluetooth technology. Here’s what that does for you. 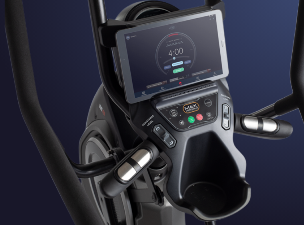 The M8 Bluetooth technology means you can use the machine with Bowflex’s Max Intelligence software which basically gives you intelligent video and training workouts that are displayed and interact with your workout on your mobile devices; iPhones, iPads, etc. You can also stream the interactive software to your television with the use of an Apple TV or other streaming hardware device. The Max Intelligence App basically takes over the job for your console. For example, when you plug the Bowflex M8 Maxtrainer into your iPad, the display on your console will switch to your iPad. When your are connected to your mobile device, you will no longer see anything displayed on your console. This isn’t necessary, because the iPad gives you everything you need; heart rate, RPM, time, etc.. The console of the M8 is a little bigger to allow you to snugly mount various sized screens for your moble devices. 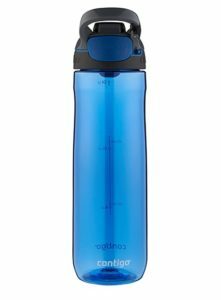 There is also room on the bottom for a remote or water bottle. Here’s my little secret. I didn’t actually own both of these Maxtrainers. I bought a Bowflex M7 back in December when I stumbled upon a really enticing online deal. Having had it a month I was disappointed to learn that the bluetooth technology was not interactive. In other words, I would never be able to use 3rd party apps that could actually control things like speed, resistance, and workout performance etc. When I called Bowflex to ask them about this, they informed me of an upgrade that would essentially turn my M7 into an M8 for $299.00. I didn’t mind paying this too much because I had only paid $1,400 for the machine. My net cost with the upgrade is sitll well below the retail price of a new M8 and there is virtually no difference. The upgrade even came with a new front panel that says, M8 on it. The bulk of the package was the entire M8 console which took some assembly, but it was not too difficult. The upgrade includes a 1-year subscription to the Bowflex Video trainer. I was also pleasantly surprised that it included an arm-strap heart monitor which is far more convenient and works much better than the chest strap that was included with my original M7. Whether or not this arm strap is included with a new M8 purchase I don’t know. I do not see it listed anywhere on the Bowflex site. The main thing is that I was ready to experiment with some 3rd party apps to test how well the bluetooth interacts. Run Social is one such iPhone/iPad application that is compatible with the bluetooth functionality of the Bowflex M8. I couldn’t wait to try it .RunSocial allows you to choose various virtual scenery and compete with other runners, bikers, etc from around the world. Unfortunately, I did not notice that the bluetooth did me much good other than to detect my speed. The routes I ran didn’t seem to adjust incline for going up and down hills. The big other big problem with RunSocial is that the scenery is very unrealistically repetitive. How likely is it on a run across the country that you will pass the exact same 1997, white Subaru legacy 12 times? On to other apps. 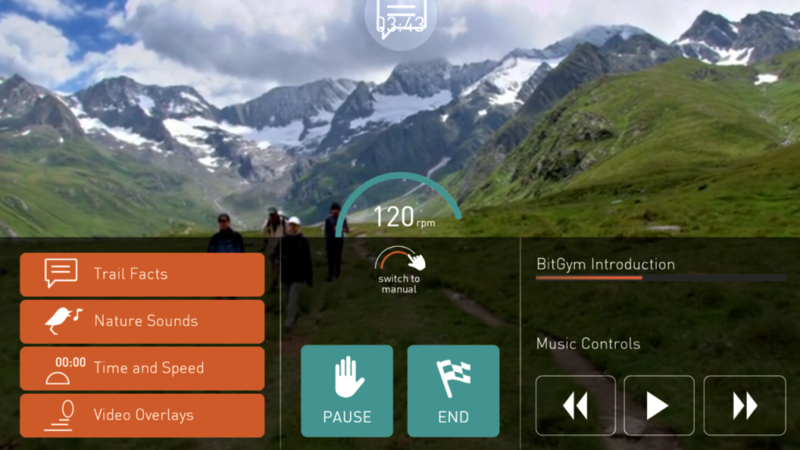 I discovered BitGym when I first purchased my Bowflex M7 and it remains my favorite exercise scenery app. BitGym does not require the Bluetooth interactive functionality of my machine. Rather, it uses the motion from your device’s built-in camera. This is amazingly accurate which makes my whole reason for requiring the M8 vs. the M7 pretty much worthless. At least, until I find another app that actually interacts with things like resistance. Oh well. It’s nice to know I have the best elliptical Bowflex makes. But, how good is the actual machine? Basically, I bought this machine in order to keep myself in good cardio shape. I replaced an old, recumbent bike that served me well the last 10 years. What impressed me at the Bowflex Maxtrainer M7 I tried at a local sporting goods store was how sturdy it felt; just like a commercial elliptical trainer. Also, I felt that ergonomics of the Bowflex M7 felt good for the core of the body. It does not put too much emphasis or overwork any parts of the body. The Bowflex M7 is a 300lb machine with 20 levels of resistance. It has built-in, heart-rate monitor grips which project your heart rate on your screen or on your mobile device.